Much of the 6,100-acre Weidert property is currently planted to row crops. Touchet, Wash.—A tract nearly twice the size of the existing vineyard acreage in the Walla Walla Valley AVA goes to auction Nov. 10 with the promise of being the western bastion of grape production in the appellation. 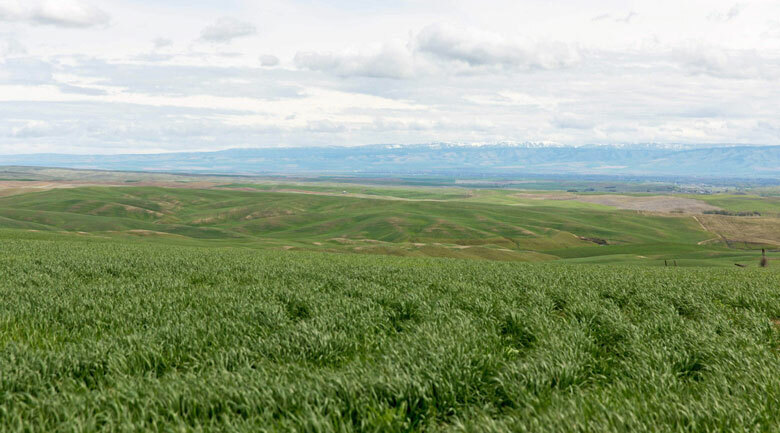 Peoples Company, an agricultural property firm based in Clive, Iowa, is working with Tim Weidert to sell a 6,100-acre parcel at the top of Nine Mile Hill, where the Walla Walla Valley empties to the Columbia River. Bisected by Highway 12, the site is currently planted with approximately 5,500 acres of row crops. Conservative estimates based on topography suggest the property could support at least 1,600 vineyard acres, but water rights attached to the property could support more than 4,000 acres of vineyard. Growers have planted 2,964 acres in the AVA to date. Should a grapegrower buy the Weidert property, it could easily boost the AVA’s planted acreage by more than 50%. “Conservatively, if you planted grapes on the land above 800 feet, there are nearly 1,600 acres above this elevation and plenty of water for grapes, with water left over for other crops such as tree fruit or blueberries,” Steve Bruere, president of Peoples, told Wines & Vines. Site elevation is key because air drainage from the upper reaches of the valley risks damaging vines on the lower slopes as it rushes down to the Columbia. The airflows drive warmer air, which rises to higher elevations. Data collected between July and October this year indicate temperature variations of 8° to 13° F between the lowest elevation of 430 feet and the highest of 950 feet. “The air drainage is so spectacular: When you get on the top of this property, you’re at a dome for the whole area, and the air drains to the east and the west and the south,” Bruere said. The fall’s cool September saw temperatures average between 54° and 79° F at 871-881 feet in elevation, equal to those at 1,178 feet in the upper Walla Walla Valley. The pattern repeated in October, with average lows recorded that were slightly warmer than those further up the valley. Soils are primarily wind-blown loess over glacial silts, and recent management has aimed at preparing the property for transition to new owners. Consultants to the project include soil scientists Alan Busacca of Vinitas Consultants LLC and Stuart Turner of Turner & Co. Inc. The property also is touted as having potential for growers of hops and blueberries. South of Highway 12, sandwiched between two arms of the property, is a 287-acre parcel where Ash Hollow Winery developed and operated a 55-acre vineyard planted to a mix of Cabernet Sauvignon, Merlot, Malbec and Syrah. When the winery closed in 2014, the property was sold and the vines removed. The acreage was replanted to row crops. However, the site was lower in altitude, with more than 75% of the vines sitting below 600 feet, right in the path of drainage off the Weidert property. While Ash Hill Winery’s former winemaker, Spencer Sievers (now owner of El Corazon Winery in Walla Walla), said the wines from the Ash Hollow vineyard were excellent, the vineyard itself was vulnerable. The range of elevations and the availability of water both stand to work in the property’s favor, says Marty Clubb, owner and winemaker at L’Ecole 41, located a short distance east in Lowden. These have both benefitted the SeVein project on the southern side of the valley, in which he’s a partner. The successful bidder isn’t likely to be a small company. Clubb points out that SeVein, which encompasses 2,700 acres between 850 and 1,490 feet, has seen steady but slow uptake. “It’s been in the making for 12-plus years, and it’s still got 600 acres to sell,” he said. The successful bidder for the Weidert property will need a long-term vision to support a multi-year development program that dovetails with the needs and growth of the Washington industry. Bruere concedes as much, noting that the property is well beyond the scale of most estate operations. To date, he’s fielded expressions of interest from local growers and wineries, California companies and institutional investors. Bruere expects the majority of bids to come in just prior to the closing of the auction Nov. 10 at 5 p.m. The sealed bids will have to meet a minimum price to qualify. The figure hasn’t been disclosed, but Bruere said he doesn’t expect parties that are seriously interested in the opportunity to come in short, given the state of the market. Bidders will receive an update within five days of the auction’s close, with shortlisted buyers expected to post a deposit equivalent to 10% of the project price pending due diligence. The closing is targeted for Jan. 10, 2018.